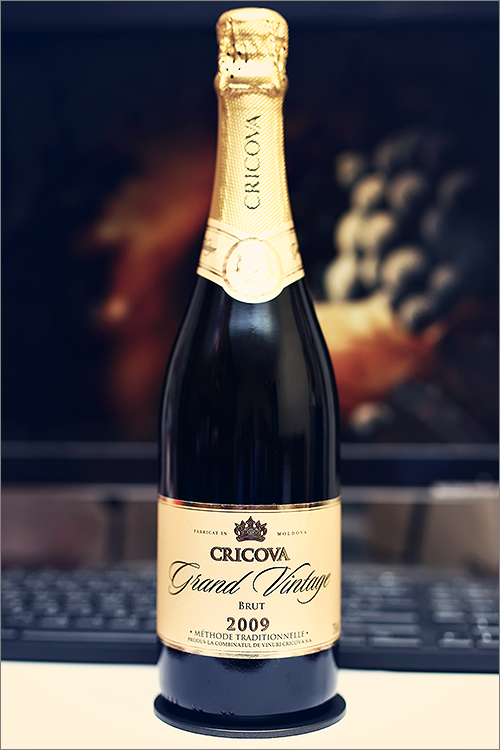 Tonight we present you one of the best crémant wines made in Moldova – Grand Vintage Brut 2009 from Cricova. It is made in a classic ‘méthode traditionelle’ or ‘méthode champenoise’ style, using only the pinot noir variety from the three main grape varieties allowed in the Champagne region, with second fermentation in the bottle, thus the wine was aged on lees for 5 years to add flavour, texture and complexity. But enough theory, let’s get straight to the review and see how good this wine is. Deep, pear-yellow color with pale yellow hues towards the rim of the glass. The nose is strong, filled mostly with sweet fruit notes: ripe yellow apple, butter, ripe quince, mango, dried melon, baked apple, quince jam, cinnamon, white cherry jam and some very nuanced hints of fermented bread. The wine is dry, with moderate alcohol level, high acidity and firm tannin. It tastes creamy, smooth and fruity, with a nuanced seedy accent. This is a quite yeasty, crisp and a bit bitter wine, with an appealing, fair overall balance. It has a medium-plus finish and a balanced, crisp and creamy aftertaste. Conclusion: this is a wine in its peak form – firm, bold and well structured, with a complex and elegant body. Drink it now, as this is the optimal time, or in the next 3 months, as there’s no reason for any more bottle ageing. To be honest, this wine never ceases to amaze us – extremely appealing despite its age, definitely one of the best crémant wines made in Moldova. We would recommend to enjoy this wine standalone, in order to explore its undeniable greatness without any distractions. Alternatively, pair it with fresh quince slices or a gorgonzola and pear salad. Enjoy!